I love Mexican food but I do not cook nearly as much of it as I should. That’s probably because I live in Houston, and good real Mexican food or it’s descendent, Tex-Mex, is very easy to find. I’ve been planning to make Mole some time soon because that is one dish that is rare to find well made at your run of the mill Taqueria. Most of them use a paste that comes in a jar instead of making their own from dried peppers, nuts, herbs, raisins and chocolate among many other things. No Mole this time though (which probably will not be vegetarian anyways), instead I made some zippy black bean enchiladas with tomatillo sauce. This green sauce is probably my favorite of the dozens of Mexican salsas. It is tart, from the little tomatillos which are NOT green tomatoes, but a sort of large berry. 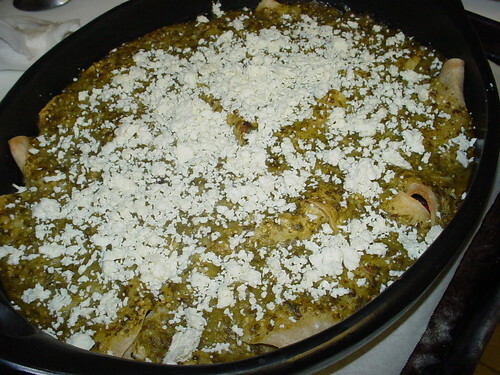 It is fragrant with cilantro and flavored with garlic and a little jalapeno. All the ingredients except for the cilantro are roasted and then pureed with the chopped cilantro. That’s it. I made it the day before and also cooked the beans. 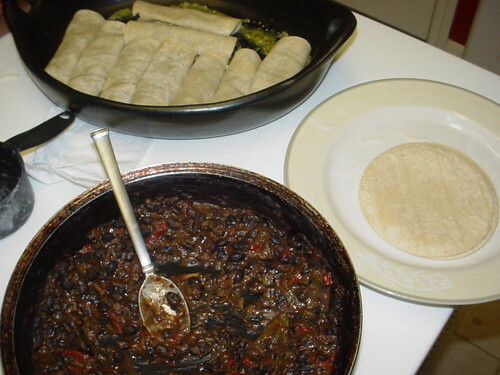 To make the filling, I mixed the cooked black beans wit gently sautéed sweet peppers and chili powder. I heated the store-bought tortillas (It’s a weekday after all) in the oven after brushing them with a bit of corn oil then started rolling. The other ingredient in the filling was some plain melting white cheese. 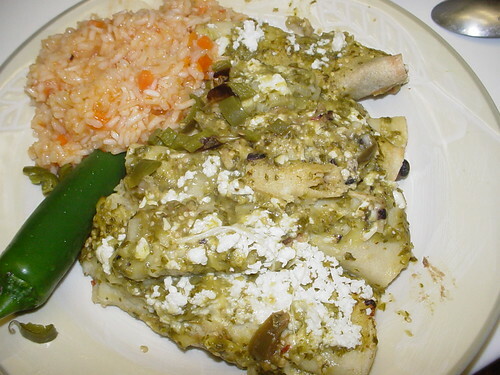 The rolled tortillas were placed in a baking dish that was smeared with some of the salsa and then topped with the rest of the green sauce. After baking till bubbly I crumbled some white farmer’s cheese on top. Served with Mexican tomato-y rice and sour cream.